Before you go on vacation to the Maldives or spend you honeymoon there like I did, use our Maldives maps to find the better spots and locations. The Republic of Maldives is situated in the Indian Ocean. The Maldives Islands consists of 1,190 islands grouped in 26 atolls stretching more than 800 km from north to south: crossing the equator at their south end. We repeat: the islands are small and so are the airports :-) The Maldives are located about an hour's flight southwest of Sri Lanka in the Indian Ocean. You can see 26 atoll formations, comprising over more than thousand islands and scattered like gem stones in a north to south direction. 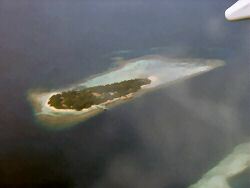 Only 199 of all the islands are inhabited (population about 240.00) and 75 Maldives' islands have been set aside exclusively for tourist resorts. deposited by waves and currents.